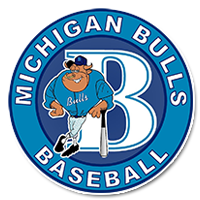 The Bulls originally started in 1995 as combined 13 and 14 year old team competing in the North Metro Sandy Koufax Division of the Little Caesars’ Baseball League. While they finished the season with a respectable win/loss record, the team would soon experience dramatic changes with the loss of half its personnel due to age limitations. However, upon acquiring several key players the following season, the Michigan Bulls found themselves a formidable force, emerging that year as one of the eminent 14 year old teams in the nation. California, and the U.S. Territory of Puerto Rico. Defeated by the Texas Baseball Academy in the Series’ finale, the Bulls finished second in the nation overall, ending their season with an impressive record of 60 wins and 7 losses. In 1997 the Bulls advanced to the Mickey Mantle Divisional play in the Little Caesars’ Elite League. As a 15 year old team, the Bulls faced a tough challenge ahead, competing in a league dominated by some of the finest 16 year old teams from Southeastern Michigan and Ontario. The Bulls took their knocks but finished solidly in the third place, earning the right to advance on to District play. In District competition, the Bulls established their mark as a young, up and coming team, by yielding little ground until losing in the District finals. The Bulls also traveled extensively in 1997, competing in tournaments in St. Clair Shores, MI, Atlanta, Georgia, Coco Beach, FL, and Kokomo, IN. The 1998 Michigan Bulls set their sights high and achieved most of their goals. They either won or were a runner-up in every tournament they entered and went to the AABC’s World Series in McKinney, Texas. The Bulls rode their success from ’98 right into 1999. As 17 year olds the Bulls once again faced some of the best competition in the nation. They captured the Midwest Elite League Championship – Connie Mack Division and were runners-up in the NABF 17U National Championships finishing with a 42-10 record for the year. In 2000 the 18U Michigan Bulls had their sights set on one place, Farmington, NM. But before the World Series the Bulls successfully defended their Midwest Elite League Title, captured tournament championships at the Black Swamp Classic (OH), USSSA Tourney (MI), Mayors Invitational (MI) and a second place finish at the Bob Cene Memorial (OH). The AABC Connie Mack Districts were up next and the Bulls found a tough challenge in front of them, Underwood-Ore. 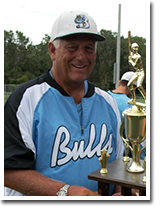 Led by Will Tollison (now a Bulls Director & Coach), Underwood-Ore took care of the Bulls for most of the championship game, until Dave Barkholz notched his second home run of the game to give the Bulls a walk-off, 3-2 victory. The AABC Regional was loaded with great teams from the Midwest. The Red Birds and the Youngstown Astro Falcons were both forces to be reckoned with, but the Bulls held strong, knocking off Youngstown in the championship game to advance to the 2000 Connie Mack World Series in Farmington, NM. Teams at the series included Midland Redskins, East Cobb Yankees, Encinitas Reds, and Puerto Rico. The Bulls faced some of the top prospects in the nation and finished strong with a victory against Puerto Rico in their final game. Manager Frank Gallagher was awarded the ’00 AABC North Central Regional Coach of the Year for his tremendous work the boys. In 2001 the Bulls moved up to the Livonia Collegiate League, a wood bat league. The 2001 campaign ended with an impressive 28-10 record. After a third place finish in their first year, the Bulls won their first of five straight league championships in 2002 and finished 4th in the AAABA 20U World Series in Johnstown, PA. In 2004 the Bulls were NABF National Runners-Up and in 2005 they were the NABF National Champions. 2007 marked the first year the Michigan Bulls put multiple teams on the field. Along with the collegiate team, a 10U team was created including numerous future Division 1 commits (Colin Goslin – University of Michigan, Dion Henderson – University of Kentucky). Since then the program has grown to 18 total teams in 2014 and has continued the tradition of developing players and competing at the highest level with over 250 players moving on to the college level and 35 to the pros. Coach Frank is now a scout for the Texas Rangers and continues to coach the collegiate team to this day, filling his roster with talent from local and regional colleges. His record stands at 696-167 (.806 winning percentage) and includes a second NABF National Championship in 2012.